Everything about this restaurant was lovely. We started off by scoring a parking spot right in front of the restaurant, and then were seated at a cozy table by the window close to the open kitchen but with a view of the bar for great people watching. 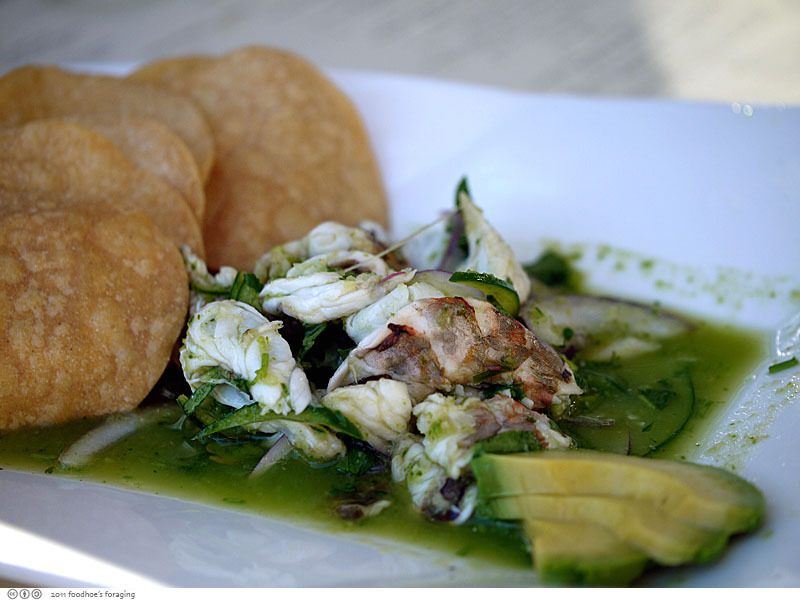 Tamarindo Antojeria is a family run restaurant that specializes in vibrant small-plates that are meant to be shared. 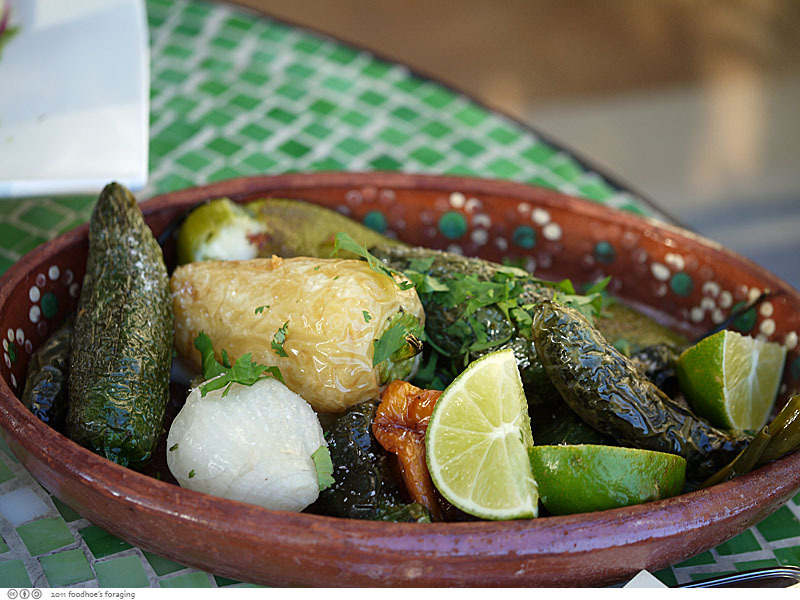 These small tastes are known as antojitos, or “little cravings,” and offer some of the lesser-known dishes of regional Mexico. 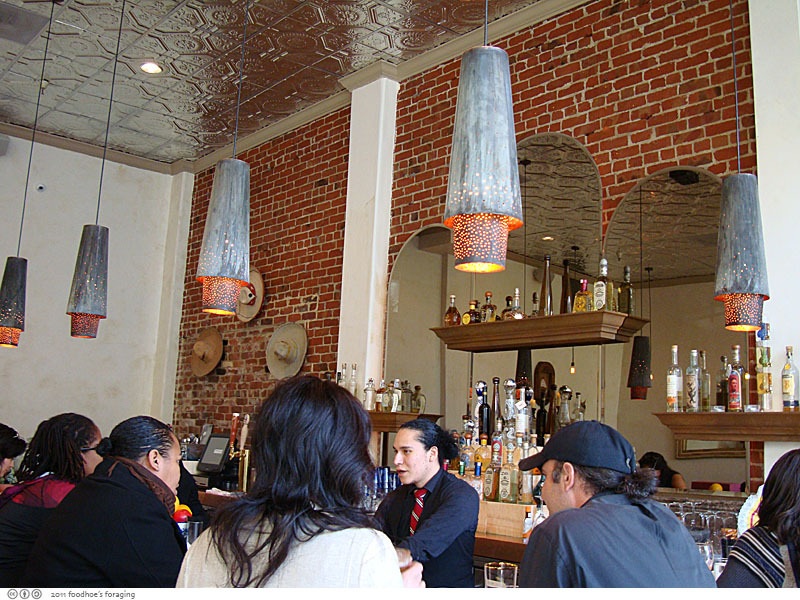 The Dominguez family were longtime owners of Taqueria Salsa in Antioch, but in 2005 Gloria and her son decided it was time for something different and opened up this upscale eatery in the vibrant old Oakland neighborhood. 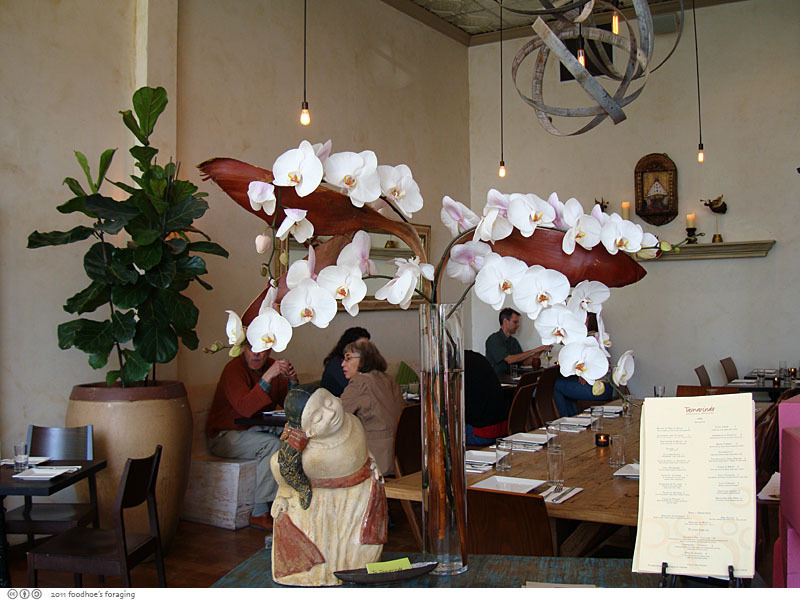 The restaurant has soaring ceilings and is full of tall windows with brick walls and dramatic architectural elements. The displays of Mexican folk art create an interesting juxtaposition of comfortable rustic against sleek and modern. The elegant and refined food reflects this with an honest simplicity that is very appealing. 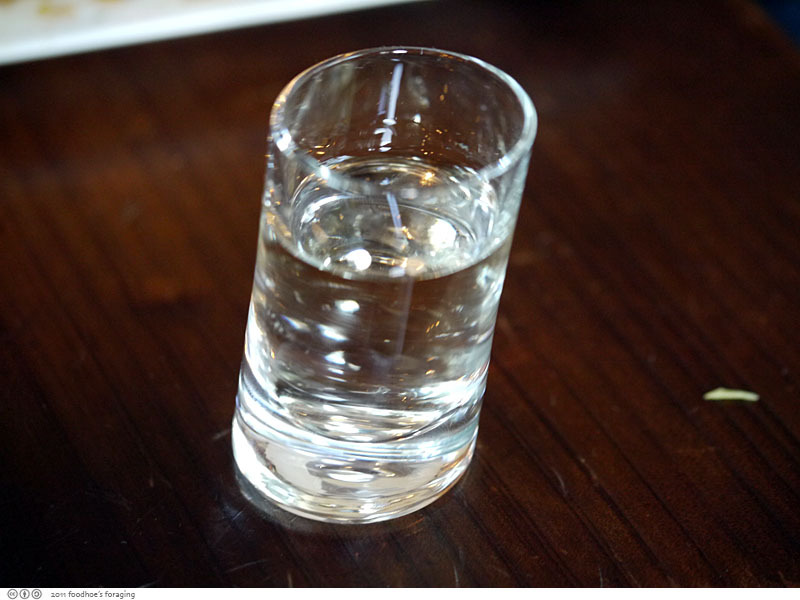 To begin, Mr. K was inspired to sample one of the tequilas, which came in this shot glass that wobbled adorably. I am sure that after a few of these, you wouldn’t notice the wobble. We so enjoyed this appetizer the first time that we ordered it again. 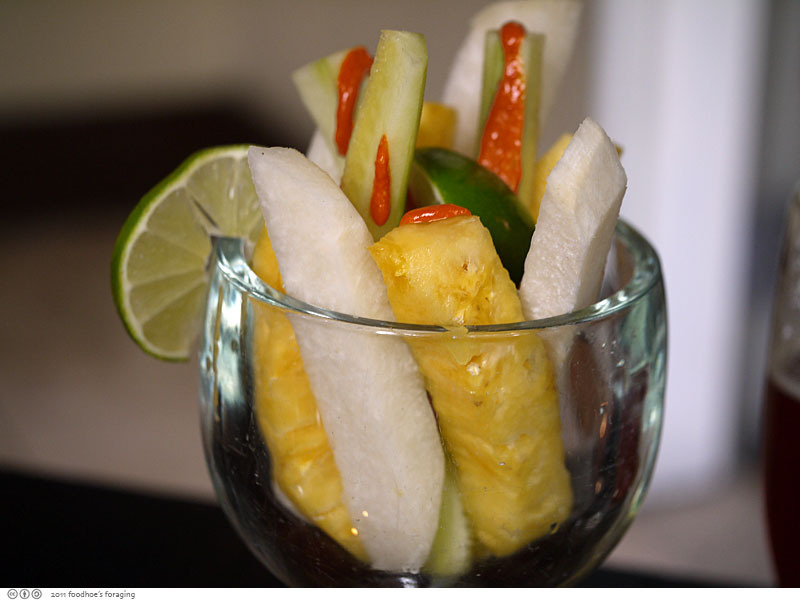 Botana de pico de gallo ($5), are spears of cucumber, jicama and pineapple drizzled with an addictively spicy chile peanut sauce, sea salt and lime juice. The pineapple was juicy and sweet, the delectable spice mixture enhanced the flavor and was absolutely addicting. The Ceviche ($12) was a small pile of shrimp in a verdant green marinade served with slices of creamy avocado to help cool the heat of the peppers. I loved piling the tender shrimp with some sliced onion onto the crisp tortilla chips. We ordered the Chiles Toreados ($8) a medley of spicy fried peppers, which I had imagined to be similar to the mild sweet shishito peppers. Boy was I wrong. These were spicy! We tried bites from each, and there were only a couple that were mild enough for us to eat, along with a grilled onion. The largest pepper was filled with melted cheese, which probably helped to diminish the heat. 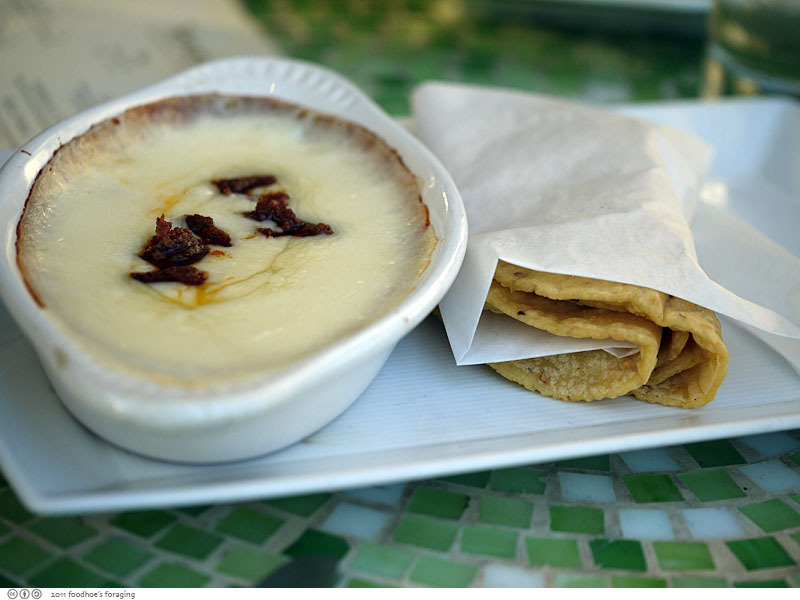 Queso Fundido $10, melted Oaxacan cheese with chorizo, accompanied with with handmade tortillas sounded intriguing, but was a small casserole filled with stringy melted cheese, topped with a few bits of chorizo. 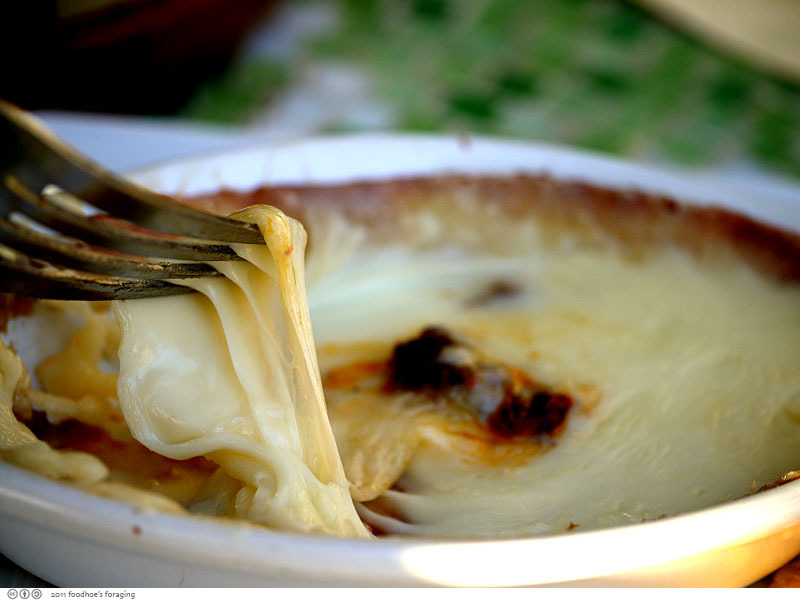 It was rubbery like a bowl of melted mozzarella, and just did not float my boat. Since there are many other delicious items to choose from, I will remember not to choose this! 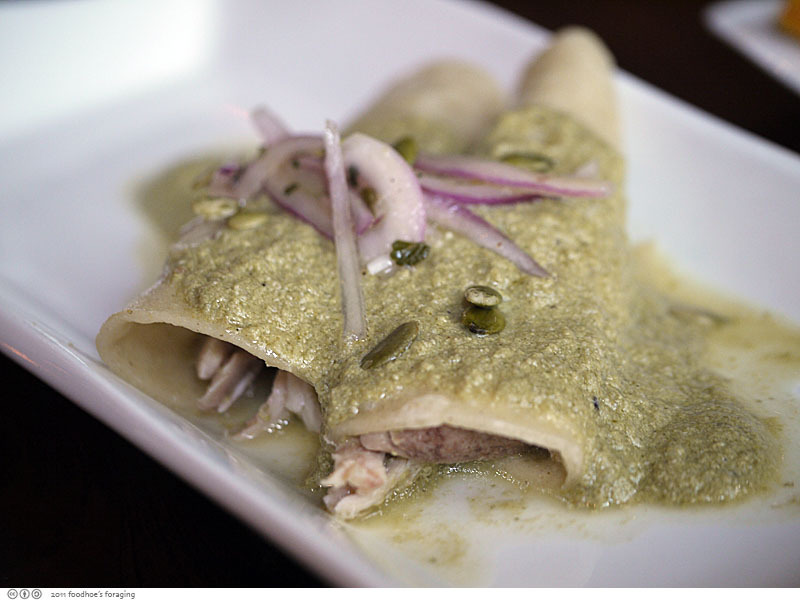 Instead, get the Enchiladas con Pipian ($8). There were two plump enchiladas, filled with tender shredded chicken drenched in a creamy, nutty pumpkin seed mole. The sauce was thick and sumptious with the tart, bright flavor of tomatillos, the sweetness of the pumpkin seeds and the tang of cilantro. The muted colors of this dish were lovely to look at and it really had the most amazing aroma, herbal, complex and very satisfying. 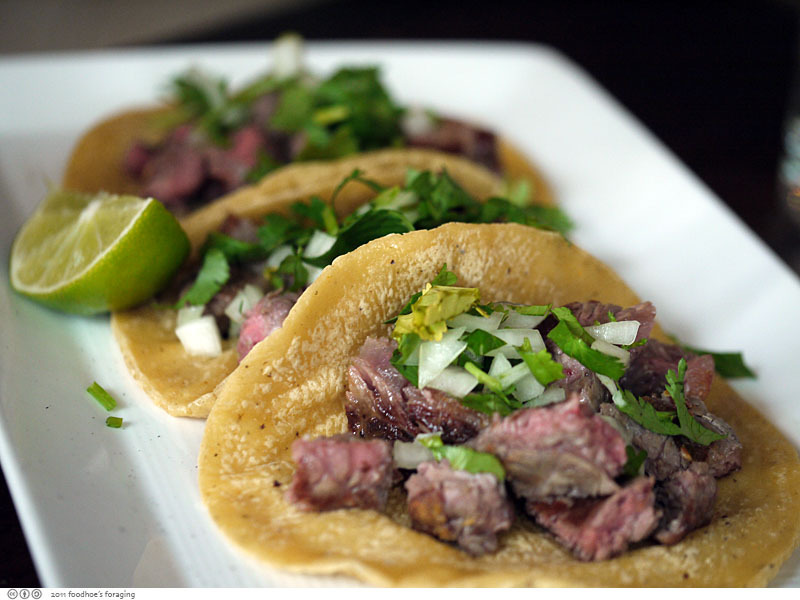 Ribeye Tacos ($12), three tacos made with handmade tortillas topped with grilled ribeye steak, cilantro and onion. Quality ingredients and the perfectly grilled steak combined to make them the best steak tacos either one of us had ever eaten. Seriously! 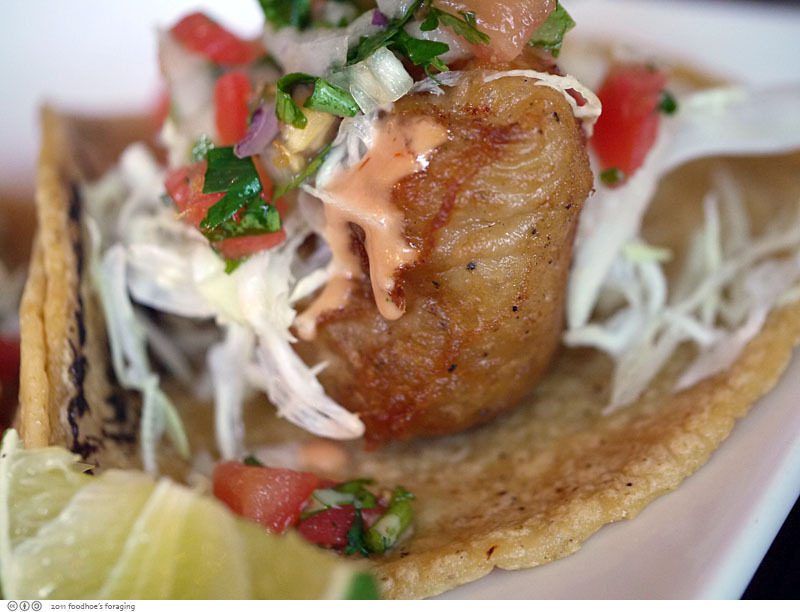 We also swooned over the Fish Tacos, Tacos de Pescado ($9), proclaiming these also to be just about the perfect combination of crisply fried battered white fish, cabbage, salsa fresca, crema de chipotle. 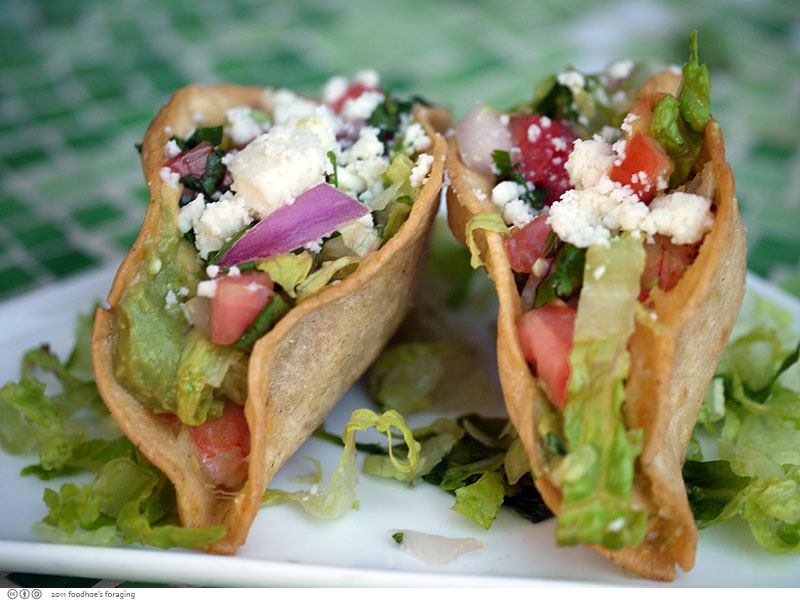 Tacos de Camaron ($9), two crispy prawn tacos with cheese, romaine lettuce and salsa fresca. Tender sweet prawns wrapped up in a crunchy fried corn tortilla, topped with fresh salsa and cheese… I just love fried tacos, this was really a treat! 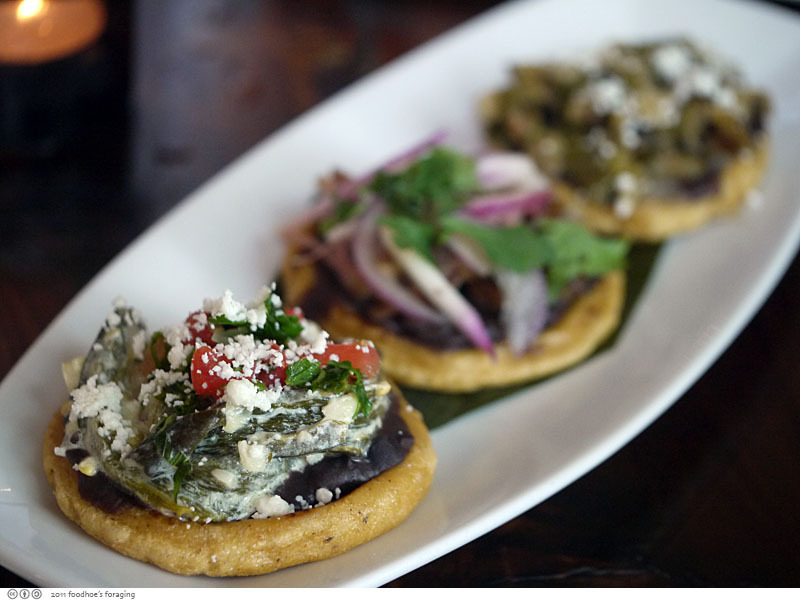 The Picaditas Surtidas ($8) were a charming trio of hand shaped disks of corn masa, each with a different topping. The first is topped with nopales (marinated cactus) and another had strips of squash over a layer of black beans drizzled with a delicious creamy sauce, the last was topped with melt in your mouth carnitas and pungent strips of red onion. 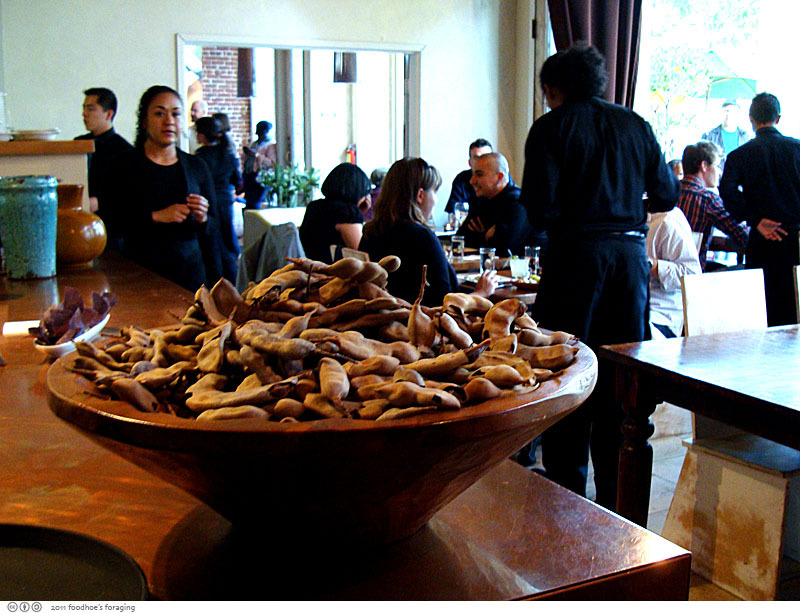 On the counter is a large bowl filled with tamarind pods that you are encouraged to open and sample. 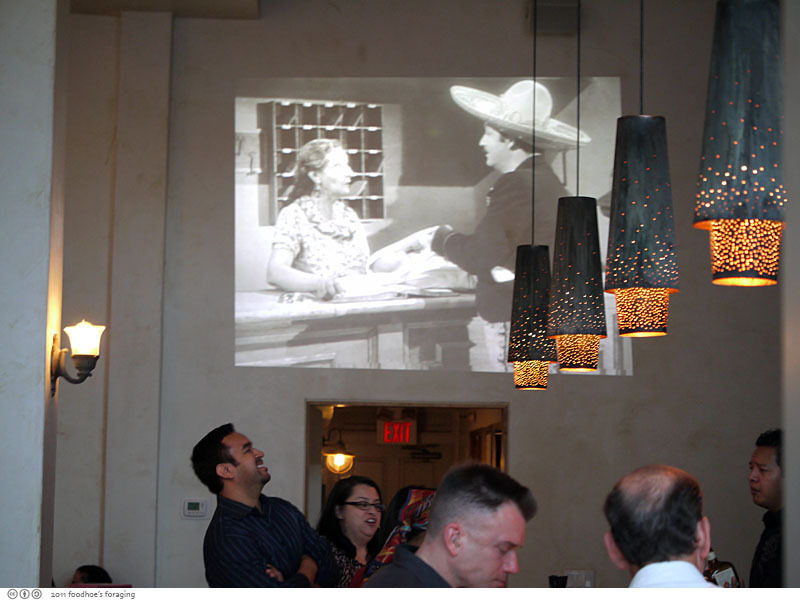 They show old black and white westerns on the back wall of the tequila bar once the sun begins to go down. 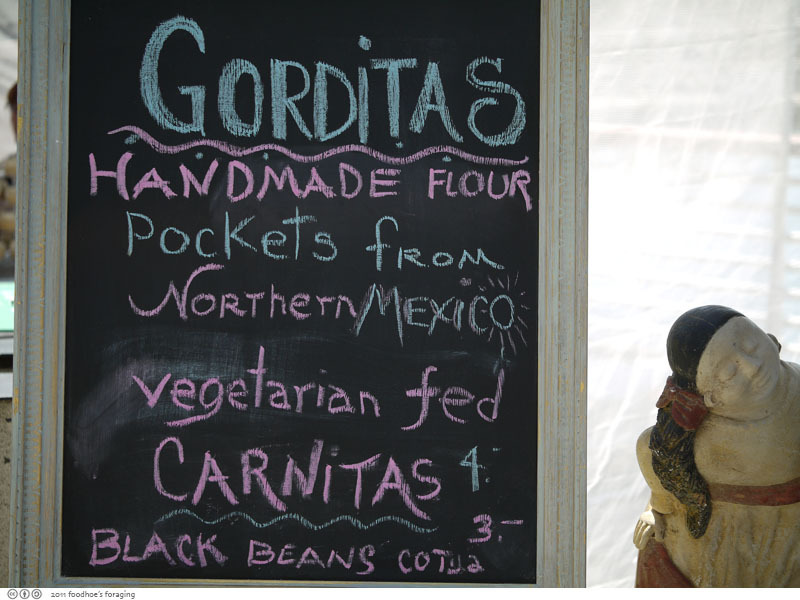 Tamarindo Antojeria appeared at the Eat Real festival last year in Oakland. 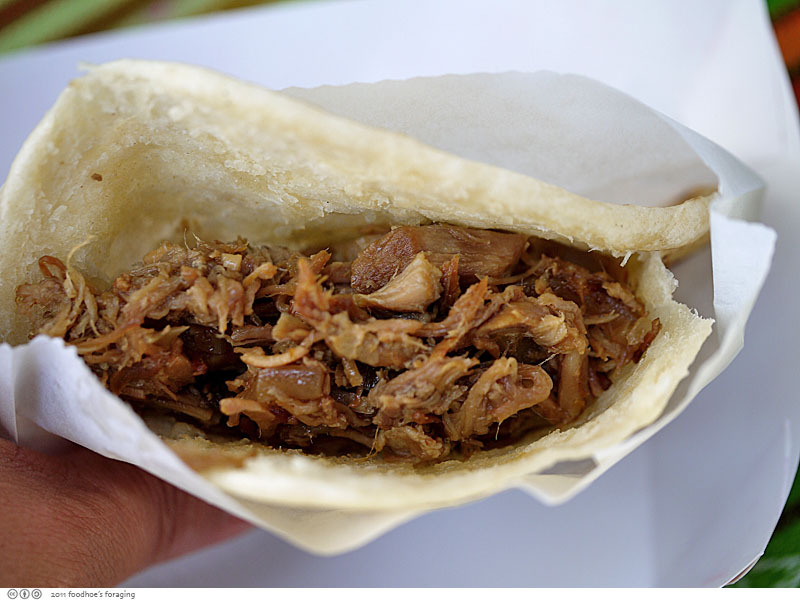 We enjoyed the Gorditas, this was stuffed with rich carnitas which was simple but so good drizzled with the fresh salsa they had in squeeze bottles. 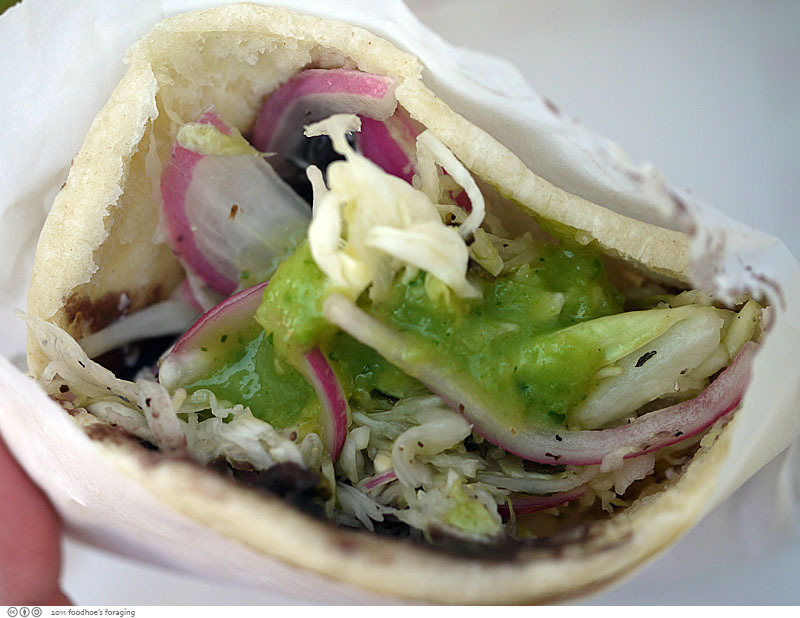 Our favorite of the two was the Vegetarian Black Bean topped with Cotija cheese and slices of onion, cabbage and drizzled liberally from the green squeeze bottle. Gorgeous Mexican food! The food there looks lovely. We just got back from Cabo and 3 days of non-stop Mexican food but this is making me want more! Oh Boy , You guys can eat a lot , except “Ribeye Tacos ” everything looks so delicious , I am having a watery mouth while writing this comment. Now, that’s a nice twist on dinner & a movie! Lovin’ those fish tacos, too. I had such high hopes for the funido. A shame it tasted like a bowl of warmed up rubber. Aside from that misstep, this place looks legit.